In August of this year I switched mouthpieces. At the time I wasn’t really sure how it was going to work out, but in the back of my mind I fully expected to end up returning to the same model I’d been playing for the last several years, a Laskey 75 (both J and G cups). I’ve been around the “Mouthpiece Wheel of Doom” a few times, so I wasn’t expecting any dramatic changes. Over the last few months, though, I’ve really grown to like the new mouthpiece, a Houser Standley GS12 model in silver, with a stainless steel rim (Model E, with H-Kote). In short, I feel like my sound, endurance, flexibility, and overall approach to the instrument have gotten better – not entirely due to the new mouthpiece, to be sure – but certainly helped along by it. Since trading up my Yamaha 667v for an Englebert Schmid a few years ago, I’ve been looking for a mouthpiece that fit the instrument a bit better. The Laskey wasn’t terrible by any means, but I always felt like I could be getting a little more efficiency and warmth of sound out of the instrument. Attacks seem more secure now, and there’s more of an envelope (not sure if that’s the right term) around the core sound, “more golden” as one former student put it. There are a couple of factors contributing to this, I think. One of them is the dimensions of the mouthpiece and cup shape. The Standley has a slightly larger, more V-shaped cup, less bowl-shaped than the Laskey, and for whatever reason this works better for me on this particular horn (how’s that for a qualified statement!) The second is the stainless steel rim with H-Kote, a titanium coating that imparts a similar feeling as gold plate, but is much more durable and long lasting (read Bruce Hembd’s review of his H-Kote rim). Flexibility is noticeably improved for me on this rim, compared to the silver plated rims I’ve played on in the past. Endurance – both long and short term – seems better as well, but this is only partially due to the new rim I suspect. In addition to the mouthpiece change I’ve also stepped up my practice regimen this semester in preparation for an audition, a recital in late November, and a recording session in December. The most gratifying thing about this experience has been getting some positive feedback on the difference in my playing. Recently I received the following email from a reader. I wanted to comment on your fine effort with the latest Kop. study – #40. In reviewing the earlier studies I cannot help but notice a change in your playing which I suppose might come from more experience and confidence in doing more of these studies. But I also wondered to what degree your change in equipment has also influenced matters – new mp rim, new horn – of what I can see. I am quite convinced that your sound has changed; changes of various positions in your studio and perhaps better use of the recording equipment notwithstanding. What I hear is a warmer, concentrated sound, with more liquid slurs, more compact attacks, and what also seems to be less effort reflected in a more pronounced sense of musicality (not that your previous efforts were not musical!). Needless to say I was flattered to receive this message, but it also confirmed some of the things I’ve been noticing myself. I plan to continue playing the Houser for the foreseeable future – I am going to try the stainless version of the cup as well just to see if there is any distinguishable difference – but that doesn’t mean I’m committed to it for the rest of my career. Sometimes little changes, like a new mouthpiece or rim – can make a big difference. For another mouthpiece tale, check out Travis Bennett’s blog. 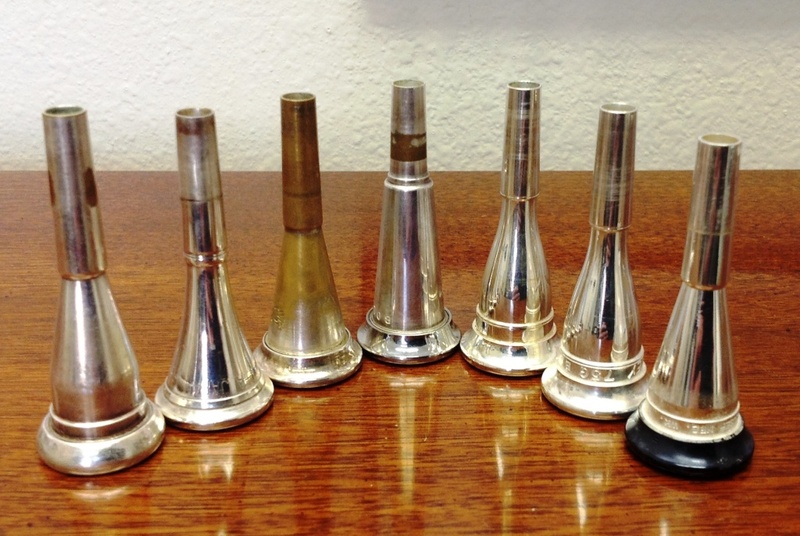 To close out this post I’ll leave you with a picture of the various mouthpieces I’ve played over the last 15 years. From left to right they are: Giardinelli C10, Yamaha 30C4, Moosewood B12, Moosewood Megamoose, Laskey 75J, Laskey 75G, and Houser Standley GS12. Why hang on to them, you might ask? Well, other than sentimental value (not much of that, except for the Giardinelli, the first mouthpiece I ever bought), I keep them because you never know when a particular mouthpiece might work really well for a student. Having extra mouthpieces around allows me to loan them out and let students try them before deciding to purchase their own. Other than the instrument itself, the mouthpiece is the most crucial piece of equipment you will buy, and worth close consideration. I am on a mouthpiece search as well. I’ve been playing a pea shooter Lawson S660 since 1995, and since getting back into shape, realizing how much it held me back. I got off it lately because of a lead pipe experiment. (note to your readers, Seraphinoff pipes do not like Lawson mouthpieces) But, like yourself, I’ve been playing the Moosewood B12 and ready to move on. I find it does not like a true orchestral fortissimo. I do have a Houser SF14, and it was awesome with an experimental pipe, but that is now removed. I am very curious to try the GS12 and will be dropping by Dave’s place on Friday to: 1. Find a shank for the SF14 that works with a conn.2.- Give the GS a try. I’ve stayed away from the Laskeys because of the rim and was not too impressed. I see that you moved on from that as well! Thanks for the comment Don! I’ve been very pleased with the quality and consistency of Houser mouthpieces, and he should be able to help you find something that works.